Picture 1:﻿ Cheburashka team: Nathan Claus, Arman Suleimenov, and Zhanibek Datbayev. Picture 2: Gold team: Michael Bernard, John Bohlmann, and Galymzhan Uteulin. Purdue took 3rd place among universities competing in the November 1st, 2008, ACM East Central North America (ECNA) Regional Programming Contest. Team "Purdue Cheburashka" finished in 4th place overall, behind two teams from CMU and one team from Waterloo. Typically, two or three teams from this region (with no more than one per school) generally qualify for the World Finals, so there is a chance that the Purdue team will be traveling to Stockholm, Sweden next spring to compete! The final decision will be made by ACM officials based on overall team strengths in the various regions. The ACM Programming Contest is a five hour event in which teams of three students work together to solve eight programming puzzles. Ranking among teams is based first on how many problems are solved correctly, then on how many minutes it takes to solve each problem. A 20 minute penalty on solved problems is added for each submission that fails to pass the judges' test cases. Programming is done in Java or C/C++. The members of the Cheburashka team are Nathan Claus, Zhanibek Datbayev, and Arman Suleimenov. 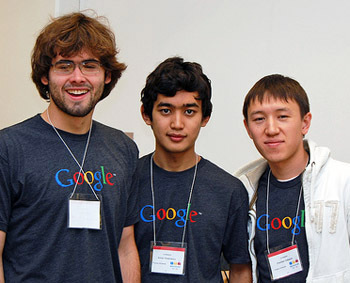 Arman is a computer science major, Nathan is a mathematics major, and Zhanibek is a computer technology major. The team was presented with USB memory sticks by a representative from contest sponsor IBM and University of Cincinnati Prof. John Franco, the local contest organizer. 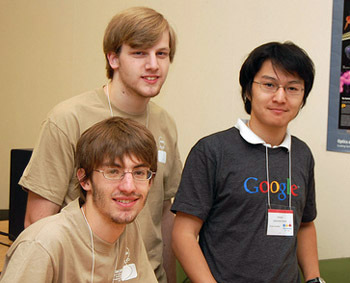 Team "Purdue Gold", consisting of computer science majors Michael Bernard, John Bohlmann, and Galymzhan Uteulin, placed 25th overall in the region (out of 117 teams), but in 5th place among the 27 teams competing at the University of Cincinatti site. They also received USB memory sticks. The contest had an exciting finish: The Cheburashka team completed three problems in the final 20 minutes of the competition, with the final problem solved at the exact 300 minute mark. These solutions pushed them ahead of rival teams from Waterloo and Cedarville, who had been ahead of them during much of the competition. The Gold team finished two of its three problems in the last six minutes, catapulting them from 49th place to 25th. Maybe working under pressure of class assignment deadlines is good training for competitions! The teams were accompanied by co-coaches Prof. Patrick Eugster and Assistant Head, Dr. Tim Korb. Lockheed Martin and Google provided financial support for the practice sessions and contest participation.